The Russian «Yenisey» won at home Kazakhstan's «Astana» — 93:84 (26:24, 29:22, 17:16, 21:22). The game began with a three-pointer by John Roberson, it became a symbol of the starting pressure of the hosts. They played well in the early attack, dealt with the «big» ones, hit a couple of long shots. During the first quarter, the advantage of «Yenisey» reached 10 points (23:13). But the ending of the period was still in favor of the guests. A pair of three-pointers from Jenkins and O’Brien's offense (11 points) allowed Astana to close the gap to one shoot- 24:26. The second quarter with the efforts of Denis Zakharov (10 points in a quarter) began with «Enisey» lead — 10: 0. Jenkins and O’Brien from «Astana» were charged (31 points in the first half for two), but without the energy of Astana’s leader Anthony Clemmons (5 points, throws from the game — 2 out of 9) they couldn’t manage to catch up. Up to break the lead of Krasnoyarsk remained very comfortable — 55:46. The third quarter began again with a jerk of «Yenisey» — 10: 2, organized by the «big» Siberians. In response, the guests «turned on» defense. Aggressive defense and individual skills of foreign players helped «Astana» to come back, reducing the gap to 10 points — 62:72. The final 10-minute began again with a spurt of Siberians — 10: 2. The rest of the quarter turned into a struggle of characters. In a viscous aggressive game, guests felt more comfortable. «Astana» cut the gap but did it too slow. Yellow-blue did not get closer than 9 points to their opponent. 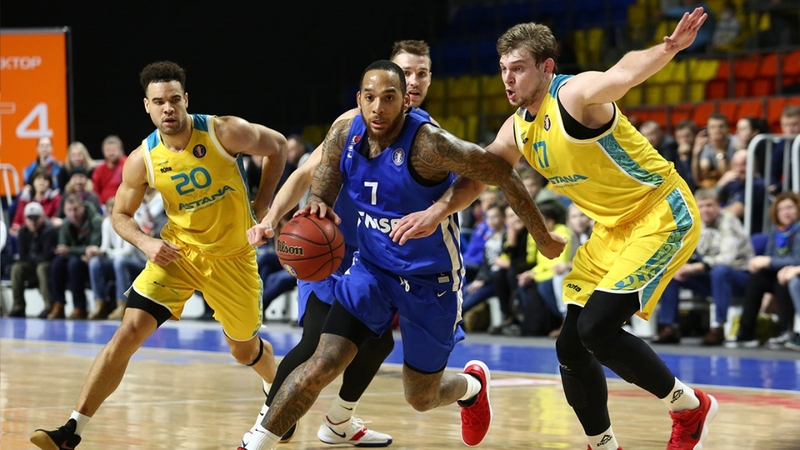 «Enisey»: D’Angelo Harrison (17 + 7 rebounds + 5 assists), Alex Young (15), Martins Meiers (15 + 9 rebounds), Denis Zakharov (14), John Roberson (12 + 7 assists), Igor Kanygin (11 + 3 block shots). «Astana»: JJ O'Brien (21 + 5 rebounds + 3 steals), Ken Horton (21 + 9 rebounds), Michael Jenkins (15 + 5 assists), Anthony Clemmons (12 + 3 steals). - We have been preparing for this game for a long time, but adjustments were made to our plans because of the injuries of Lavnikov and Meyers. «Astana» plays well this year, they have good team chemistry, we waited for a hard game. But today we had the advantage because we played well in the attack. Well done guys! - Today, we did not have enough concentration. I think that each player can sometimes play poorly in an attack if he does not catch the rhythm or if the ball does not hit the ring, but today our main problems were in defense. We will analyze the situation and work on it. The team will hold the next matches on its court, on January 23 and 24, Astana players will host «AGU Bartsy Atyrau» basketball club within the framework of the Kazakhstan Championship among men's teams of the National League. The next match of the VTB United League for «Astana» will also be held at home. On January 27, the capital basketball players will host «VEF» basketball club from Riga. Tickets for the match are available on the website Ticketon.kz.